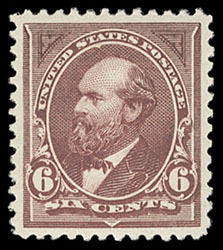 1894, 6¢ dull brown, o.g., very lightly hinged, exceptional centering amid large, balanced margins, bright vibrant color, an Extremely Fine gem; with 2002 P.F. certificate. 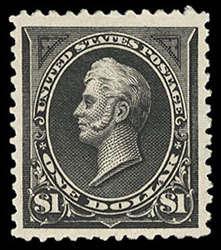 1894, $1 black, type II, o.g., very lightly hinged, evenly balanced margins and near perfect centering, rich deep color, Extremely Fine and choice, a beautiful mint high value gem; with 2000 P.F. certificate. 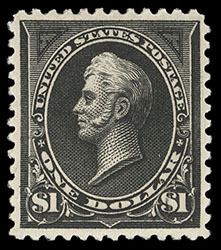 1894, $1 black, type II, o.g., barest trace of hinge, rich color on bright fresh paper, choice centering and margins, Extremely Fine, choice so nice; with 1984 P.F. 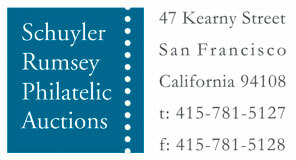 for block and 2000 P.F. certificates. 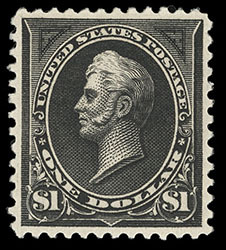 1894, $1 black, type II, slightly disturbed o.g., large margins, rich bold color, Very Fine, a big Bureau high value. 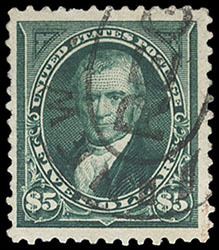 1894, $5 dark green, neat oval registry cancel, wide margins and rich color, pulled perf at top and reperfed at bottom, Very Fine appearance.